If you’ve seen an exciting crop circle and want to arrange a tour please call the Atlas Helicopters office now 01256 635000. We appreciate that crop circles have a short life expectancy due to harvesting and understand that speed is of the essence. Our phone lines are open during UK office hours (9-5) and also monitored out of hours. You can also use the form below or our contact page. We can fly a maximum of six people from London (London Heliport), Andover or anywhere that is near your home or office. Atlas Helicopters is fully certified with an Air Operator’s Certificate (AOC) which allows us to take photographers on commercial flights. 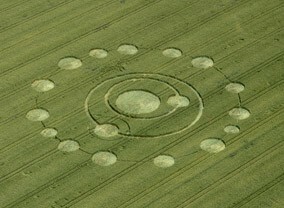 Breaking news about the latest formations is received by our team from the local and international crop circle study groups and tour operators, so you will be able to view the latest crop circles within hours of them forming, when they are unspoilt and arguably their energy is at its strongest. Wiltshire seems to include the majority of crop circles, as well as some of England’s most remarkable ancient sacred sites such as Stonehenge and Avebury Ring and Tor. Within one flight we can cover plenty of ground and you should be able to fly over two or three circles and, depending on location, see some famous landmarks. Only when you’ve seen crop circles from the air can you truly appreciate the beauty and design of these mysterious shapes. To book your bespoke tour, or to discuss more details, call Atlas Helicopters’ Operations Team or get an instant estimate with the form below.